Fused glass wind chimes can be made several ways, depending on the desired look. By making your own, you are able to custom make these chimes to match your preference and your individual decorating flair. They can be elaborate and very detailed or extremely simple, depending on what you decide to make. The style and outcome is based on the material you decide to use to make your project. You can make custom fused glass wind chime tops to string your pieces from, or use something as simple as a piece of driftwood. Whichever design you want to make you will need to drill holes in the top piece to hang the fused glass wind chimes. 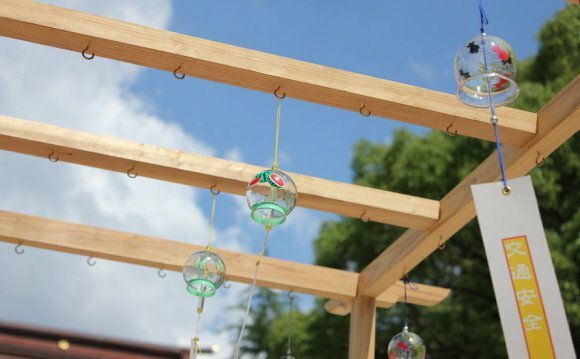 Wind chimes can be made from old bottles. Gather up some bottles and soak them in hot soapy water. Remove the labels, being sure that all the glue is removed. You can cut the bottles, or fire them whole. If cutting the bottles, be sure to read the section on If you are cutting rings and want them to fuse together, be sure that they are from the same bottle. Overlap the pieces of glass so that as they are heated in the kiln, they will melt together. When fusing these pieces, be sure to insert a piece of high temp wire, or copper wire into the opening of the bottle. As the bottle is fused, the wire will become trapped and will securely hold the hanging bottle. Use a piece of driftwood, a branch, or a piece of bamboo to hang the pieces. Drill holes in the drift wood for hanging the bottles. Hang the bottles so that they are staggered in their hanging positions. I have seen these where the top is a peacock and the hanging chimes are shaped like feathers flowing down from the bird. How about making a wind chime with a fish shape at the top? This piece could have wavy glass pieces cascading down like rippling water, or add some star shapes for starfish. Cut the shapes out of coordinating colors. These shapes can be square, round, or any geometrical shape and size. First cut your glass and lightly ground the edges. Clean these pieces thoroughly before fusing. Fusing the pieces of glass will help to make them a little thicker and stronger. Once fused, the pieces will need to have holes drilled into them for hanging purposes. Use a wire that will hold up in outside conditions, like a stainless steel nylon-coated wire. Try adding glass beads to your wire when hanging your piece. Glass beads can be strung onto the wire and twisted into place. These shiny translucent or colorful fused glass wind chimes are quite stunning. They have a clear, pleasing ring as they strike each other in the wind.